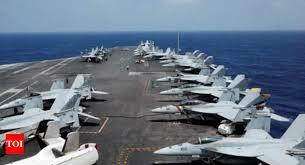 Since the early 21st century, China has broadened its ambition to control the South China Sea to the entire sea area. They not only made statements and took actions to exercise sovereignty over the seas of the Paracel and Spratly Islands, Scarborough or Luconia Shoals but also claimed overlapping sovereignty and dispatched fishing boats backed and protected by Chinese maritime surveillance, coast guard, and navy vessels to the area of Indonesia's Natuna in the southern South China Sea. This directly impacts Indonesia's national sovereignty and interests, forces the country to take a number of measures and actions on different fields to curb China's ambition. In terms of foreign affairs, Indonesia implemented an "organizational balance" solution by assigning various domestic and overseas agencies to counter and prevent China’s activities violating its sovereignty, in combination with "risk protection" measure connecting regional countries and major powers to address threats as well as emergencies. On regional and international fora, Indonesia firmly rejects China’s statement on the "Nine-dash line" and disapproved Beijing's assertion that "China and Indonesia have overlapping claims on maritime rights and interests in the Natuna Islands". Indonesian Foreign Minister Retno Marsudi emphasized: "We never recognize the 'Nine-dash line' and he said that Indonesian diplomatic agencies need to send signals on their determination of sovereignty and territorial integrity protection and to ensure that this message is not misinterpreted by anyone because Jakarta has stated it is not to participate in the disputes in the South China Sea. On August 16, 2016, after an inspection trip to the Natuna Islands, Indonesian President pledged to protect every inch of land and territorial sea of the country, to prevent illegal encroachment of Chinese fishing boats into Natuna's exclusive economic zone. In the event of the Arbitral tribunal established under Appendix VII of the 1982 UNCLOS on the Philippines vs. China case regarding the South China Sea, President Joko Widodo said Indonesia would actively participate in the dispute resolution between parties through peaceful negotiations, opposing the use of force. In its relations with China, the Indonesian government is determined to persistently and actively pursue a moderate policy to deal with related matters. Indonesia still hopes China will keep their commitment to Jakarta from the 1990s, saying that "there is no dispute over ownership of the Natuna Islands because the islands belong to Indonesia". Indonesia's Coordinating Minister for Maritime Affairs Luhut Pandjaitan affirmed: "We are still friendly with China and other regional countries, but we must protect ourselves". In the incident of June 17, 2016 when Indonesian Navy seized Chinese fishing boats and fishermen in Natuna waters, Indonesian Ministry of Foreign Affairs summoned the Chinese Ambassador to explain and clarify the case. In particular, when the Chinese Ministry of Foreign Affairs declared that the exclusive economic zone of the Natuna Islands is China's "traditional fishing ground" and the two sides have "overlapped interests and maritime rights", Indonesia immediately responded with a diplomatic note of objection. The Indonesian government and authorities also issued a public statement that strongly opposed the militarization and presence of Chinese warships in the southern South China Sea, near the Natuna Islands. Economically speaking, the Indonesian President proposes a comprehensive economic development strategy for the Natuna Islands focusing on promoting fishing, aquatic exploitation, commercial shipping, tourism development, calling for oil and gas investment, combining economy with national defense and security, etc. According to him, it is now essential to give priority to economic development in the Natuna Islands, not only to ensure national interests but also protect large sea area in the North. Thus, Indonesia will invest, develop an integrate marine and fishery center in the region, and plan to send about 6,000 fishermen to catch and exploit seafood around the Natuna Islands. On the energy issue alone, former Minister of Energy and Mineral Resources Sudirman Said confirmed that 16 oil and gas blocks have been designated in this area, of which 5 are in production and 11 are in the phase of exploration and testing. One of the most potential gas fields in the Natuna Islands located in the East area, is considered the largest gas field in Asia, with total reserve estimated at 46,000 billion m3. Currently, Pertamina oil Corporations (Indonesia), Exxon Mobil (USA), Total (France) and SA PTT Exploration (Thailand) are interested in investment cooperation for oil exploitation. On the legal aspect, on June 20, 2016, the Indonesian Minister of Foreign Affairs made a two-point argument: (1) Indonesia has a clear and internationally recognized maritime border and its claim over the sovereign rights in the exclusive economic zone of the Natuna Islands is fully based on the provisions of the UNCLOS 1982; (2) Indonesia has no dispute with other countries in the South China Sea because Jakarta does not claim any geographic feature of the South China Sea such as islands, reefs or lagoons which are dispute-causing features. Therefore, there is no overlapping area between Indonesia and China. Minister Marsudi affirmed: "This world is organized based on international law rather than on statements based on history. UNCLOS is the law. History cannot deny the law but the law can deny history. To provide legal support for the protection of its territorial sovereignty, the Government of Indonesia agreed on naming of unnamed islands, first of all, the ones on the border with Timor Leste, Australia and some small islands in the Natuna Islands. Currently, of a total of more than 17,000 islands, 8,844 islands have been named; among the islands with names, only 922 ones are inhabited. The naming of unnamed islands was determined by Indonesia to reinforce its baselines claim, "to prevent neighboring countries from claiming sovereignty" and to help naval forces protect their national maritime areas more easily. Besides, Indonesia declares it planned to rename waters around the Natuna Islands to "Natuna Sea", covering the entire maritime area in the South-West of the South China Sea, between the Malay Peninsula, Kalimantan and Sumatra islands. If the "Natuna Sea" is officially recognized by the United Nations, the border will run from the Natuna and Anambas Islands in the north, passes by Karimata and Gaspar Straits to Java Sea in the south, and is bordered in the west by the sea between Bintan Island and Malay Peninsula, connects to Singapore Strait and Malacca Strait. According to the Indonesian Government, the policy of renaming the sea around the Natuna Islands to "Natuna Sea" is to: (1) Assert maritime sovereignty, rejecting the so-called "historic interests" and "Nine-dash line" claim of China; (2) Strengthen control at sea, especially the exclusive economic zone around the Natuna Islands, to deploy oil and gas exploration and exploitation, use and management of the seabed and natural resources; (3) Contribute to increasing transparency of maritime sovereign rights, demonstrating its stance to enforce the law on prohibiting illegal fishing, strengthening effective management of government agencies; (4) Justify the legal basis for announcing the "Regional natural resources and oil and gas exploration map around the Natuna Islands and related areas". In terms of military, in 2002, Indonesia lost Sipadan and Ligitan islands to Malaysia. This is the reason why Jakarta does not want to "a history repeated" in the Natuna Islands, especially when China always claims "historic sovereignty" over this maritime area. President Joko Widodo affirmed that the Indonesian government is determined to protect the islands at its best, taking strict measures against territorial intruders. In the immediate, in addition to strengthening patrol forces, sending high capacity law enforcement vessels to protect, resolutely arrest and sink or burn any violating foreign fishing boats, the Indonesian Navy would establish the Satgas 115 - a task force - to combat illegal infringement activities. Coordinating Minister of Maritime Affairs and Fisheries Susi Pudjiastuti stated: "Indonesia will not care about which country the ships or ship owners belong to. If they catch our fish, we will punish them straight away irrespective of bilateral relations in such situation”. In 2017, Indonesia's maritime functional forces seized and burnt many illegal foreign fishing vessels, including three Chinese ones. On June 28, 2017, the Indonesian parliament (DPR) approved the 2017 budget for the Ministry of Defense at USD 8.25 billion, an increase of approximate 10% compared to that of 2016. Part of this budget is used to upgrade the existing air base, to build a new port in the Natuna Islands that will allow various warships and aircrafts. Since 2016, Indonesia has conducted many prolonged, large-scale air, naval and army exercises in the Natuna Islands with the participation of thousands of soldiers, aircraft, warships, anti-ship missiles and special forces. In the long term, Indonesia would strengthen its defense system in the Natuna Islands in response to China's plan to control the South China Sea. It is expected that in the coming years, Indonesia's Ministry of Defense might build radar stations in the Natuna Islands to control the whole area; deploy four more task forces in several islands with important positions; set up a number of small-scale military bases to form a defense system; build two new air bases in Ranai Island and Anambas Islands, permanently deploy Su-27, Su-30 and F-16 jet fighters; increase warehouse facilities, logistics services; deploy a number of multi-purpose air defense artillery complexes, etc. In addition, to strengthen protection of its sovereignty, Indonesia is also keen to develop its naval forces as well as promote defense cooperation with the United States. The two sides have reached policy consensus that the United States would provide technical assistance on equipment for the Indonesian military to build a supposedly largest radar system in the region, with an expected wide range of covering entire the South China Sea and its vicinity. It can be said that sovereignty and interests competition between China and Indonesia in the surrounding areas of the Natuna Islands have complicated developments, with a potential of turning into fierce clashes. Although the Indonesian government has issued many new guidelines on improving management capacity, diplomatic, military, economic measures and strengthening legal bases, it is difficult to change China's ambition in the South China Sea in general and the Natuna Islands in particular. Therefore, if Indonesia is to protect its interests at sea, it needs to continue to take strong actions against China’s violating sovereignty acts in the Natuna Islands and raise its voice in support of neighboring countries in solving sovereignty disputes in the South China Sea. There are several layers of disputes in the South China Sea: disputes over the ownership of islands, disputes over rights in the waters between the islands, disputes over the regional balance of power and disputes about the future of global governance. What makes them difficult to resolve is that many details of the rival claims remain obscure. Information in a Chinese article on the Fiery Cross Reef are completely fabricated. According to international law and practices, the Fiery Cross Reef is a rock, not an island. China does not have sovereignty over the Fiery Cross Reef. Its purpose of militarizing the Fiery Cross Reef is very clear, whereas the purpose of international public service is only fabricated. Forty five years ago, in Jan 1974, China attacked and occupied the Paracel Islands of Vietnam. The incident took place when Vietnam was still being divided with southern Vietnam under the administration of the Republic of Vietnam headed by Nguyen Van Thieu, a close ally of the United States. The Paracel Islands was under the effective control of Nguyen Van Thieu administration. The question is why the Republic of Vietnam, a close ally of the US fought the Paracel battle alone and lost it to China’s hands. It is necessary to revisit history to learn the lesson about friends and allies. Could the Paracels Islands be "lost" to China? 45 years ago, from January 17 to January 19, 1974, China dispatched its naval forces joined by militia on warships and armed vessels to attack islands located on the western side of the Paracel Archipelago of Vietnam, including Robert, Money, Duncan and Drummond islands. With its force superior to that of Vietnam and taking advantage of regional context when the United States had abandoned the government of the Republic of Vietnam, China occupied the above islands and the entire Paracels. Lu Kang’s remarks about Chinese fishery enforcement activity in the South China Sea is abnormal because the location where Chinese agencies carried out their duties is under sovereignty of Vietnam instead of China’s. It is Chinese coast guard ships that infringe illegally Vietnam’s waters. After Chinese President Xi Jinping's state visit to the Philippines, the media in the region and the Philippines report of an agreement between China and the Philippines on joint oil and gas development in the contested waters claimed by both parties in the South China Sea. On November 23, 2018, three days after the MOU was signed, Philippine Foreign Affairs Secretary Locsin said there was no agreement between the Philippines and China on oil and gas joint exploration in the disputed areas and the MOU signed on November 20 during President Xi's visit only meant a search for prospects for oil and gas cooperation between the two countries. Almost a week after the opposition called for an investigation into the agreement, the Philippine President’s office on November 26, 2018, leaked out the text of the MOU on maritime energy cooperation between China and the Philippines signed by the two on November 20, 2018 during. Although the waters for cooperation was not specified in the text, a look into the MOU, its negotiation process of the past two years and the Foreign Affairs Secretary Locsin's statement suggested that the two sides were working towards agreement on oil joint exploration cooperation in the Philippine waters which are part of China’s claim of the "nine-dashed line". So it can be said that President Duterte’s administration has left the door open for joint oil and gas exploration with China in its waters. So what has President Duterte’s government gained by this MOU? The mass media suggests that President Duterte’s government has certain economic and diplomatic gains in this. In terms of economics, China agreed to fund $ 232.5 million for the construction of the Kaliwa Dam project. China’s Gezhouba Group has committed $ 2 billion to set up an industrial park at Clark City. So far, it is one of China's largest investment in the country. China and the Philippines have also signed an agreement to build a 581km railway from Los Banos to Matnog and an agreement on infrastructure development in Davao, the home city of President Duterte. In addition, as President Duterte said, Xi Jinping also promised to strengthen trade and investment, and actively participate in the "Build, Build, Build", a grand infrastructure program worth of $180 billion initiated by President Duterte. In terms of diplomacy, the relations between the two countries after the visit seems to become warmer, at least through flowery words about friendship by the two heads of state. As said by Mr. Xi, "Our two countries will always be good neighbors, good friends and good partners who will enjoy shared development and prosperity". China’s Ministry of Foreign Affairs, in an emailed statement, also confirmed that "China attaches great importance to working closely with the Philippines and will actively support President Duterte’s “Build” plan. However, these modest economic outcomes certainly do not meet President Duterte’s expectations. Only 4 out of the 38 projects promised by Chinese to invest in the Philippines in 2016 are re-committed during Presient Xi’s visit. China's pledged funds for the above projects accounts for only about 10% of the amount that China has committed to the Philippines when President Duterte visited China two years ago. Also, China's financial commitments during this visit are unlikely to be realized, just like two years ago. President Duterte’s government urged China to realize its committed investment of $ 24 billion in the Philippines. However, most of the deals just remain on paper. According to Secretary of Socio-Economic Planning Ernesto Pernia, only a loan of $ 73 million for an irrigation project and a $ 75 million grant to build two bridges in Manila have been disbursed so far. On relations with China, President Duterte prides himself for helping build a friendly relationship with China, turning China from a hostile country into a big reliable friend of the Philippines. That statement is probably true only to Duterte, not to the country and people of the Philippines. Duterte views Beijing as a trusted friend and Beijing also considers him a trusted friend. However, China probably is not a good neighbor, good friend and good partner of the Philippines as Xi said. China continues to threaten Philippine’s maritime sovereignty, reaffirming its sovereignty and jurisdiction over the waters of the Philippines located in the "nine-dashed line". People can ask whether a country which always wants to violate the Philippine’s sovereignty and marine resources could be “good friend, good neighbor, good partner” of the Philippines? In addition to the above little gains, President Duterte and the Philippines also loose bigger. For President Duterte, it was a loss of faith of the Filipino people in his determination to protect maritime sovereignty. 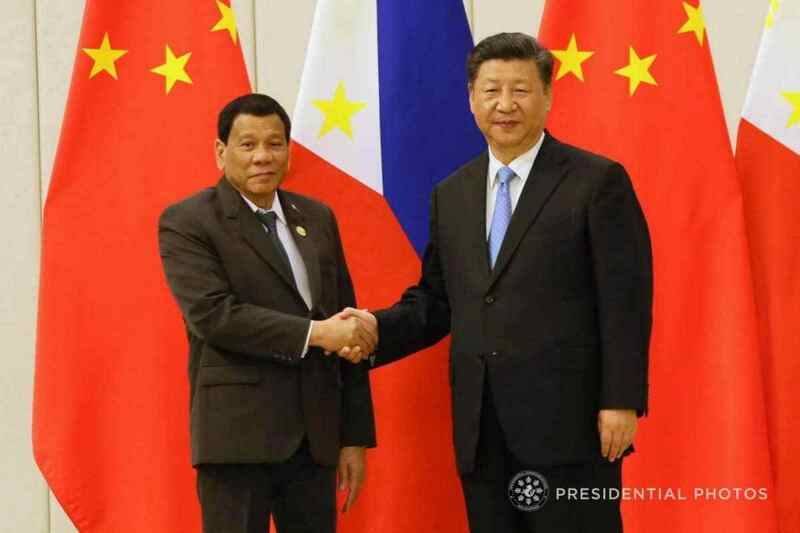 According to a survey just before President Xi's visit to the Philippines, 84% of Filipinos were not happy that the Manila government has taken no action in the South China Sea, resisting to criticize China’s attempts to increase military presence in the South China Sea as well as to request China to adhere to the PCA ruling. Filipinos believed Duterte had offered China too much in terms of politics in exchange for loans and investment of billions of dollars are now just promises. The people’s confidence in President Duterte will be further lowered after he signed with China an MOU of energy cooperation in the South China Sea. It is also a great loss for the President himself: declining voters’ trust. If it officially signed an oil exploration agreement with China in the Philippine’s waters which are within the China’s "nine-dashed line", Duterte and his administration could hardly win the support of Philippine voters in the mid-term parliamentary elections be held in 2019 and in the president election to be held in 2020. 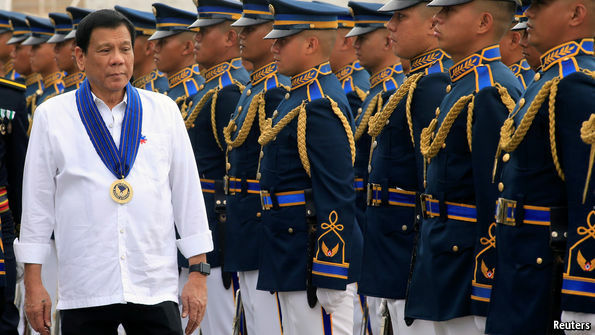 These are the concerns that Duterte must consider in the next 12 months. The opposition in the Philippines also strongly criticized President Duterte's administration for agreeing oil and gas cooperation with China in the South China Sea. The Finacial Times quoted Senator Antonio Trillanes IV’s statement that any agreement with China on oil and gas cooperation in the Philippines’ waters would undermine the sovereignty rights of the Philippines and violate its constitution. Before the MOU was signed, Fernando Hicap, National Chairman of the fishermen’s union told the New York Times that the Philippines may sign an agreement to realize plan for cooperation during Mr Xi’s visit, which was “like a complete surrender to China’s claim of the sovereignty and control over the resource-rich waters” of the Philippines. For the country and people of the Philippines, the biggest loss is that, by signing the MOU, President Duterte’s administration has in principle indirectly acknowledged Philippine’s waters in the "nide-dashed line" were disputed waters, thus putting China equal to the Philippines in the Philippine’s waters, though according to international law and the PCA ruling, the Philippines has indisputable sovereignty and ownership rights to the resources in its waters. The second loss is the signing of the MOU has somehow nullified the PCA ruling, an important legal basis for the Philippines to deal with Chinain settling disputes in the South China Sea. The self-disabling of the PCA ruling and detachment from international law will undermine the maritime sovereignty of the Philippines. In the long run, the pressure over the Philippines on sovereignty will not decrease but rather increase because the MOU will reinforce China's sovereignty claim in the South China Sea in general and the Philippine’s waters in particular. What President Duterte’s administration is doing obviously runs against the desire of most of Filipinos and the interests of the Philippines. In brief, by signing the MOU on oil and gas cooperation in the South China Sea, the gains for the Philippines are limited while the losses are much greater. For the country and the people of the Philippines, an agreement on joint exploration or exploitation of oil and gas with China within the Philippine’s waters and China’s claim of "nine-dashed line" will have very serious impacts on the Philippine’s sovereignty. First of all, the Philippine’s waters will officially be transformed into disputed waters and in the long run will no longer belong to Filipinos. Therefore, the people of the Philippines will definitely not allow President Duterte’s administration to sign such a disastrous deal. At a Security Conference in Makati, Manila, the Philippines on December 7, 2018, Gregory Poling, Director of the Asia Maritime Transparency Initiative (AMTI) at the US Center for Strategic and International Studies (CSIS) observed that the underlined mission of Chinese maritime militia forces is to threaten their neighboring countries with sovereignty claims in the South China Sea. Though these forces are just showing up as fishing fleets, we should keep them in close watch.